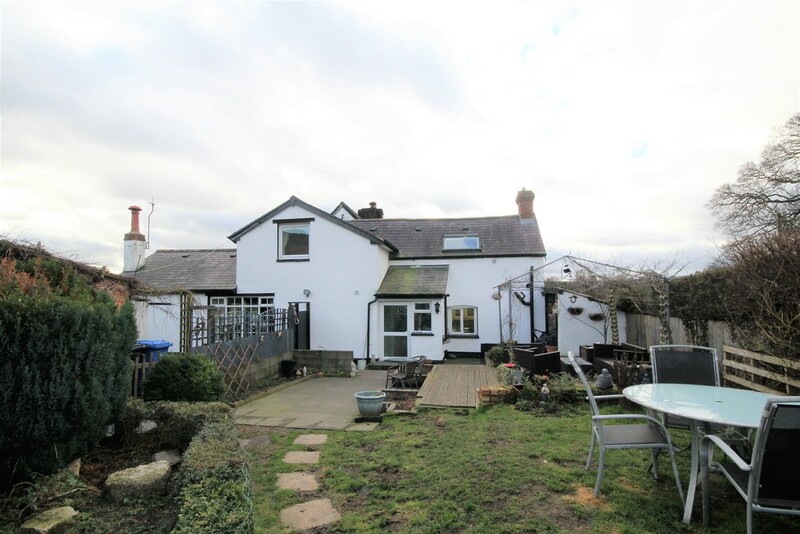 Situated in a popular and sought after location between Ruthin and LLanbedr is this well presented 3 bedroom semi detached family home which stands in about 0.25 acres. The property has generous size family living accommodation to briefly comprise, entrance porch, lounge/diner, sitting room, study fitted kitchen, side porch/utility room, ground floor bathroom and to the first floor there are 3 double bedrooms, bedroom 3 with ensuite bathroom.. The accommodation is complimented by oil fired heating and UPVC double glazing and externally there are established gardens with pleasant views, ample off road parking and garage. DESCRIPTION: Situated in a popular and sought after location between Ruthin and LLanbedr is this well presented 3 bedroom semi detached family home which stands in about 0.25 acres. The property has generous size family living accommodation to briefly comprise, entrance porch, lounge/diner, sitting room, study fitted kitchen, side porch/utility room, ground floor bathroom and to the first floor there are 3 double bedrooms, bedroom 3 with ensuite bathroom.. The accommodation is complimented by oil fired heating and UPVC double glazing and externally there are established gardens with pleasant views, ample off road parking and garage. As selling agents we would highly recommend an internal inspection of the property to fully appreciate the accommodation on offer and the pleasant and convenient position. DIRECTIONS: From the Mold office turn left and proceed through the traffic lights and out of the town to the roundabout and take the 2nd exit for Ruthin. Follow the Ruthin Road for about 10 miles passing through Gwernymynydd, Loggerheads and LLanferres and proceed down into the vale and the village of LLanbedr and the property will be noted on the right hand side via the Molyneux for sale sign. LOCATION: Situated in a popular and sought after location with easy access to Ruthin Town centre with good access to Mold Town centre, Chester city centre and the surrounding areas of employment. HEATING: Oil fired radiator heating installed. ENTRANCE PORCH Panelled radiator. Wall mounted electric metres. UPVC front entrance door. LOUNGE/DINER: 22' 3" x 14' 8" (6.78m x 4.47m) Panelled radiator Wood effect floor covering. Feature beamed ceiling. Stairs leading to first floor. Brick fireplace with raised hearth and inset multi fuel burner. Tv point. Window to front of property with pleasant views over farmland and the Clwydian range. SITTING ROOM 21' 2" x 15' 6" (6.45m x 4.72m) Two panelled radiators. Wood effect floor covering. Feature beamed ceiling. Fitted multi fuel burner set in an impressive inglenook style fireplace. Tv point. Wall light points. STUDY: 6' 6" x 6' 2" (1.98m x 1.88m) Wood effect floor covering. Power and lighting laid on. KITCHEN/BREAKFAST ROOM: 15' 8" x 7' 9" (4.78m x 2.36m) Panelled radiator.The kitchen is fitted with a comprehensive range of modern wall and base units with worktop surfaces with inset Belfast style sink with and integrated appliances to include fitted range and integrated dish washer. Tiled floor. Window to rear over looking the gardens. SIDEPORCH/UTILITY ROOM: 5' 7" x 5' 3" (1.7m x 1.6m) Freestanding Worcester oil fired central heating boiler. Plumbing for automatic washing machine. Door to side of property. BATHROOM (DOWNSTAIRS) Heated towel rail. Fitted 4 piece white suite comprising wc, wash hand basin set in vanity unit, panelled bath and shower cubicle with fitted shower. Extractor fan. Tiled floor tiled walls. STAIRS AND LANDING: Panelled radiator. Sky light. Two built in storage cupboards. BEDROOM 1: 14' 4" x 12' 5" (4.37m x 3.78m) Panelled radiator. Inset ceiling lighting. Feature beamed ceiling.Window to front of property with views over the Vale. BEDROOM 2: 12' 1" x 9' 9" (3.68m x 2.97m) Panelled radiator. Window with views across the gardens and Clwydian range. BEDROOM 3: 10' 6" x 9' 6" (3.2m x 2.9m) Panelled radiator. Feature beamed ceiling. Wood effect floor covering. Velux roof light with pleasant views. ENSUITE BATHROOM: Panelled radiator. Part tiled walls. Fitted 3 piece suite comprising wc, wash hand basin set in vanity unit and panelled bath with electric shower above. OUTSIDE: The gardens are a major feature of the property and extend to about 0.25 acres and to the side of the property there is an enclosed domestic area with outside storage shed with power and lighting laid on. To the rear of the domestic area there is a paved patio area and raised decked seating area which offers pleasant views over the gardens and Clwydian range. There are flower and shrub boards and a further brick outhouse and timber shed. There is a gated access on to a generous lawned area which offers a private aspect. There is a decked seating area and flower and shrub boarders and further gardens store. There is a driveway offering ample off road parking for up to 4 cars with double gates opening onto the main road, with a detached garage, timber shed and greenhouse.